Few if any Supper Clubs can boast a chef especially flown in from Italy, their suitcase loaded with local produce and an inexhaustible enthusiasm for their regional cuisine. That is what is on offer at this innovative partnership between the delightful Jill and chef Cinzia of Florence, Tuscany. Last Saturday, Dr G and I headed to well-heeled Fulham for the first supper club evening of Cucina Cinzia. We had a real sense of excitement; being their first event, it was hard to know what to expect. We arrived at the elegant home of Jill, an American who has lived in London for the last 11 years with her husband and two children. First impressions were good – we were soon welcomed into Jill’s beautiful family home, offered a glass of Prosecco and personally introduced to each of the other guests. It felt as if we were taking part in an old friend’s dinner party, such was Jill’s personal welcome, except that we did not know any of the guests or the host! Cinzia joined us in the living room where we were served the “Stuzzichini” (or aperitifs). These were dainty cheese pizze and parmesan cheese straws; they tasted fresh and delicious and were the perfect accompaniment to our Prosecco. I put my rusty Italian to some good use. Despite my faltering grammar I was soon chatting to Cinzia about Tuscany, her passion for food (she greatly admires Japanese food), her beloved Tuscan cuisine, and about the dishes we were about to sample that evening. Her enthusiasm was contagious. We were then served our antipasti “Tris di Crostini” – a trio of Crostini Toscani (made from chicken livers), Leek & Gorgonzola Crostini, and Dittini di Mousse al Finocchiona. The latter, and my favourite of the three, was a delicate pastry filled with a mousse made from Finocchiona. Finocchiona is a cured Tuscan salami, marbled with fat and flavoured with wild fennel seeds. It is aged between 5 and 12 months, and is made of 50% lean meat (pork belly & shoulders) and 50% fat (pig cheeks). The flavour of this salami was intense and utterly delicious, and it worked remarkably well in the mousse and pastry. Our next course was “Zuppa di Farro” (Spelt Soup with Cannelini beans and Leeks) – I was initially intrigued by this dish but was pleasantly surprised by how creamy and delicately flavoured it was. It was a deliciously hearty soup with the cannelini beans and fried bacon giving it a real lift. I loved the delicate but wholesome flavours of this soup. “Pennette al Frantoio di Marco” was served next. The pennette pasta was accompanied by a delicious sauce made with olives from the grove of Cinzia’s brother-in-law Marco. We were also offered some highly concentrated olive oil to drizzle over our pasta. This had also been pressed from olives at Marco’s grove. This was one of the simplest but also one of the most sensational dishes of the evening – it encapsulates what for me is the essence of Italian food – the very best ingredients cooked in the simplest possible way. A gorgeously decorated platter of “Frutta Fresca” (fresh fruit) was served prior to dessert and worked well as a palate cleanser. “Torta di Ricotta e Pinoli” (ricotta and pine nut cake) was served with “Mousse al Caffe”. The cake was deliciously moist and creamy. This was also a clever combination as the delicate sweetness of the ricotta cake contrasted well with the light and slightly bitter flavour from the espresso mousse. I felt privileged to have experienced Cinzia’s cooking, Jill’s generous hospitality and the company of some very charming diners. Cucina Cinzia is a real gem of a supper club, and one that I am certain will be over-subscribed in no time. Verdict – One of a kind, I cannot think of any other supper clubs offering such authentic and delicious Tuscan dishes as Cucina Cinzia. For real Italian food in London this is definitely the place to go. A great addition to the underground dining scene in London. Highly recommended. By Tiffany Morris on 1st March 2011: The London Foodie review of this restaurant sounded absolutely incredible. I was excited to try it and invited along two friends from Cambridge that both love Italian and were intrigued by my enthusiasm for London underground restaurants. We arrived at Jill’s home and were greeted with Prosecco and led to the garden to meet the other guests on what was a beautiful sunny Friday evening. The aperitifs included fried zucchini flowers with a very light batter that were absolutely delicious. The rest of the dinner flew by and while the atmosphere was relaxed and lively, the food was unfortunately not memorable. The main was filletini of pork with spaghettini di verdure (very fine julienne of sauteed veggies twirled on top). My friends’ compared it to Tesco value pork with some chopped veggies. As we were leaving Jill and Cinzia gave us each a little jar of Tuscan herbs to take away. They were lovely hosts, and despite my love for the simplicity of Tuscan cooking we felt this was just too simple. I know Cinzia brought many of the ingredients from Italy, but it just wasn’t obvious in the meal. The meal was nice and we enjoyed the atmosphere, but we wouldn’t be quick to go back. Thanks so much Luiz! It was great to share the evening with you and the other guests and we're looking forward to future events! And *complementi* on your italian, which was fantastic! My dad (he speaks fluent Italian from his mom's side) would have loved it! @ Jill - glad you like the review, and thank you and Cinzia again for a fantastic evening. I can't wait to to back to Cucina Cinzia! @ Taste of Beirut - Cucina Cinzia is such a gem of a supper club, Jill & Cinzia were excellent hosts, I cannot recommend them highly enough. @ Oriana - thank you for your kind comment, and welcome to my blog! SO come on then, which has been your favourite underground restaurant so far? And no skirting the question! Looks like an interesting venue. Did I miss something or was there no meat / fish course? @ Helen - I've been thinking about your question - the thing about Supper Clubs for me is that they are all unique - it would not be fair to say I prefer one over another as they all offer something different. I have a real admiration for Uyen of Fernandez and Leluu, but equally for Cinzia/Jill and Arno of Saltoun Supper Club. @ Mr Truffle - welcome back Mr Truffle, and I am glad you noted that. I have spoken to Cinzia and Jill and they assured me that a "secondo" (either meat or fish) will be offered from now on. To be honest, I did not feel that it detracted from the overall experience as the flavours of all dishes were superb, and I was quite full by the end of the meal. Hi Jen, Cucina Cinzia is incredibly good value and the food is fantastic, well worth saving your hard earnt cash for. 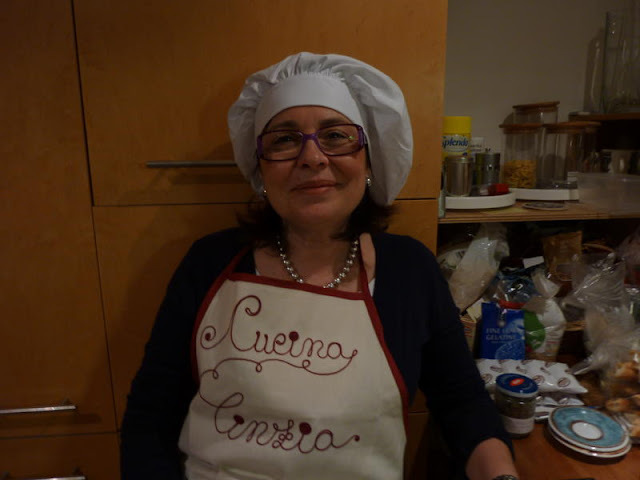 There is no other way with Cinzia - she will speak to you whether you understand Italian or not such is her enthusiasm and love for her cuisine. Jill is always around though translating in fact her whole family speaks Italian even the children. Cinzia mentioned that she would like to teach in the UK and I am very curious to learn more or when she will be hosting a first class. I cannot recommend Cucina Cinzia enough! Hi Jen! First cooking class, coming up on 14 March! We'd love to see you at an event sometime! 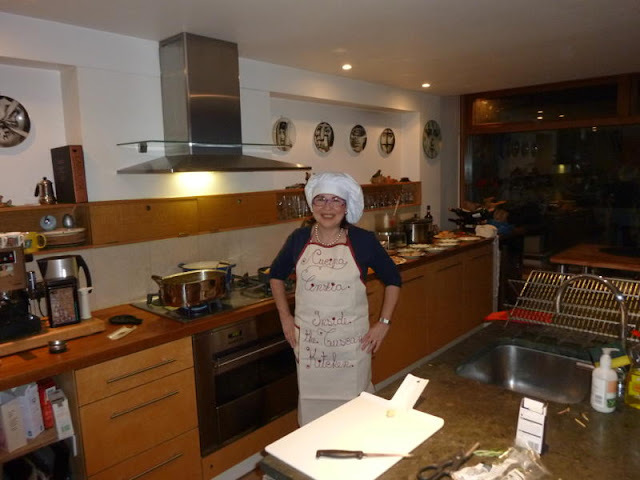 I know Cinzia's Kitchen,it is simply fantastic! it is an explosion of fantasy in her kitchen!I love so much her Lasagne not the classic with Ragù (with meat sauce)...but with Gorgonzola and carrots or with artichoke or asparagus or leeks but the must are the Lasagne with cuttle-fish with black cabbage!! !Let's try it! What a beautiful memory!!! Join them!!! @ Miky - thanks for stopping by, I don't know whether Cucina Cinzia and Cinzia's Kitchen are exactly the same but I will find out and let you know. @ Sandra - these "frittelle di San Giuseppe" sound just like the business, I can't wait to try them myself, thanks for that. Sorry, yes Cinzia's kitchen is the same of Cucina Cinzia. Hi Luiz, do you know if Supperclub is present also in Italy? If not, do you think that it could be introduced? Thanks for this review, this looks fabulous. I need to find someone who fancies going with me as my husband just doesn't like the idea of attending these supper clubs. @ Maurice - I cannot recommend Cucina Cinzia highly enough, if you live in London and would like to try real Tuscan cuisine, this is the place to go. Try and book a place if they are still availabe. @ Miky - thanks for clearing that up! @ Francesco - I am not aware of any Italian supperclubs, but I will do some investigative work and let you know. I can't see why the concept would not work in Italy, I struggle to think of any Italians I know who are not foodies. I think the market in Italy is huge. @ Kavey - it is a pity that our 12th March meet up at F&L didn't quite work out. I will be going back to Cucina Cinzia possibly in May 10 (if they are not fully booked) with a bunch of Italian friends and will send you a mail nearer the time for you to join us. The beauty of supperclubs is that you will be sitting with other guests at the table, more like a dinner party so whether you bring a friend along or not, you will invariably have company there. We shared a table at F&L NYE party with a lady who was there on her own, she had a lovely time. Cinzia yesterday for my birthday fritters cooked rice, which will prepare for you in London in March next Supperclub! simply wonderful! 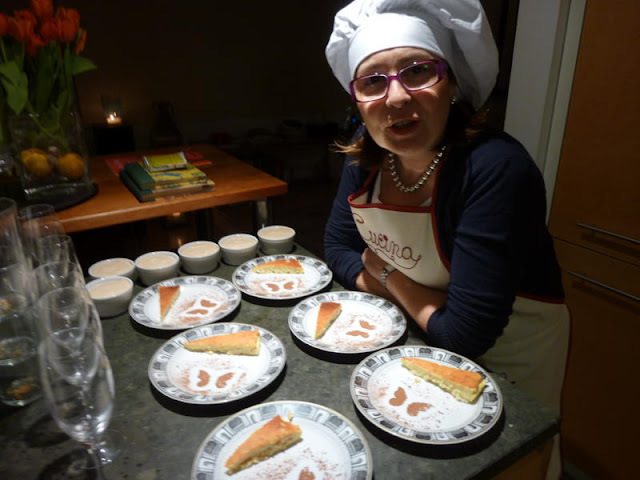 Why I didn't found any other reviews of Cinzia's supperclub?